The fees & discounts for Pilgrimage 2019, shown on the page here-linked, are completely revised and up-to-date. However, the registration form itself and the page here-below do not yet reflect the revised fees & discounts. Organizers expect the new form and the page below to be ready for registration by the end of the first week of April, 2019. Ready to make pilgrimage? Then it’s time to register. Still have to ‘line a few ducks in a row’? Then it’s time to pre-register. Register as an individual, group or family for more than one day of pilgrimage. Register for SUNDAY ONLY — whether as individual, group or family. No fee for Sunday registration. Who PRE-registers? Everybody else, before they finally register. Pre-registering is for you (and your friends etc.) if you wish to make pilgrimage, but need to postpone a final decision — for whatever reason, and don’t wish to put off other preparations. Pre-registering also helps if you are seeking a sponsor to offer “alms for palms“, to help cover your fee when you finally register — or to secure a discount in one of the discount periods. Prefer to read about the pilgrimage on a couple pages offline? Would you like to mail-in your registration? Download & print-out the pages linked here. Please note that registrations received by mail are NOT eligible for any group or family discounts, whether before or after the discount periods. Just found out about the Pilgrimage? It’s never too late to register! Click on the links above. 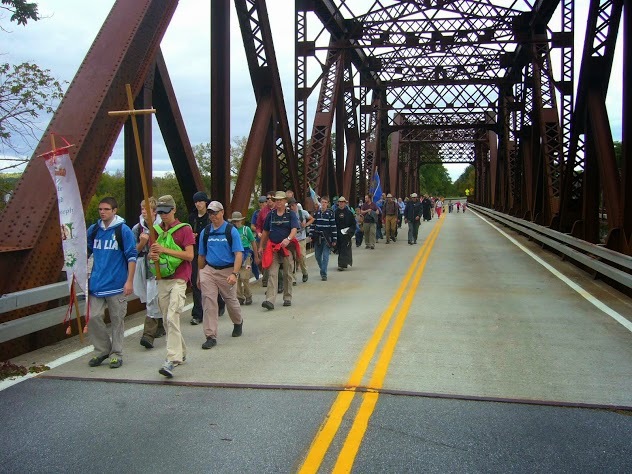 If you’ve learned about pilgrimage at the proverbial last minute, you may also register as a ‘walk-on’, on site.